This is Kolkata Police Vacancy Job Recruitment 2017 published an official Job notification to hire best candidates who completed 8th Class eligibility can apply for Civic Volunteer Job. 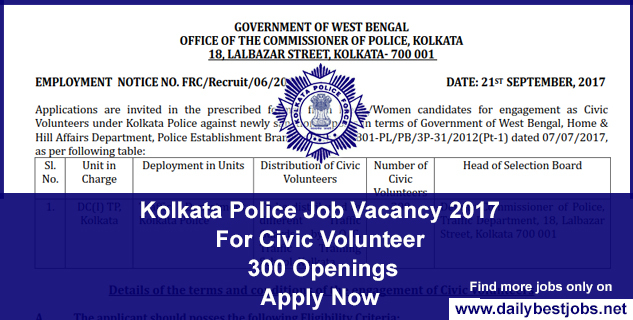 Those candidates who are interested & eligible can read about job notification details & apply for Kolkata Police Job. To know Job description, How to Apply, Qualification, Selection Process & other job required details. You must Download PDF for official Job Advertisement Notification which is available below. Read below all required Job details before applying to Kolkata Police Recruitment 2017 apply online is not allowed. You can know the below given official Job notification details to apply for Kolkata Police Vacancy 2017. Download below Official Job Notification & Job Application Form. Total No. of Vacancies: 300 Post Vacancies. Education Qualification Requirements: 8th Pass & more details check in official Job notification. All candidates must have remember the last date to Apply for Kolkata Police Job Vacancy Recruitment 2017 on 28/09/2017. How to Apply for Kolkata Police Job Vacancy Recruitment 2017? All Interested & Eligible candidates have to read official Job notification in a prescribed format. You can fill Job Application Form and send it given Kolkata Police Address with all required documents. Subscribe now your email for more Jobs and like us on Facebook. Share it with your friends who eligible & interesting for Kolkata Police Job Recruitment 2017.